For GolinHarris' Chicago headquarters, TPG Architecture designed a series of huddle spaces that allow for group interaction and private discussion -- in plain sight. Evoking a retro rec room, the chat space, where employeees and clients can work more unilaterally and with less formality, illustrates how office design is borrowing from the hospitality industry. Once upon a time, a person asked to envision the workspace of the future might have detailed the trappings of a space-age utopia: robots, flying pods and out-of-this-world architecture. But ask today's architects about tomorrow's office, and the conversation is more likely to include touchpoints such as communication, collaboration and integration. Instead of being out of this world, the next wave of offices is down to earth--and, to a greater extent, designed around employees' needs and specific company cultures. "Design is one of the great leveraging tools companies have at their behest--and it's not just furniture," says Barry Svigals of Svigals + Partners in New Haven, Conn.
One size does not fit all. Increasingly, Svigals says, his architecture firm helps companies understand who they are and how to preserve that identity through effectively designed space and use of resources. "There's a branding aspect that's important to innovative companies. It's not only for the outside world, but for them--to remind them of who they are." Firms like Svigals' see themselves as collaborators with clients, mirroring a trend that's shaping the office of the future by deconstructing relationships and reinventing them. Formalities between clients and companies have relaxed, as have corporate hierarchies. The corner office is isolating, not coveted. Cubicles are relics; walls have come down. Instead of the impressive conference room, the must-haves for new offices are communal multipurpose spaces designed to stimulate conversation, cooperation and inspiration. "Companies are [considering] how you cultivate community in a context that gives people connections to one another--and you see the design of space following suit," says Georgia Collins, who specializes in workplace strategy as a managing director in the San Francisco office of commercial real-estate giant CBRE. So, what will shape the office of the future? We asked architects in top markets for their predictions. 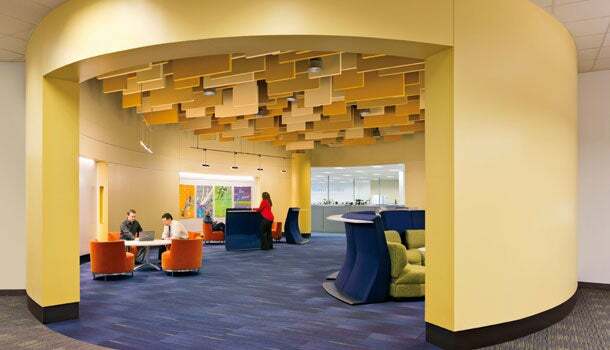 For Yale University's Shared Services department, Svigals + Partners turned a cubicle farm into a series of collaborative, egg-shape huddle spaces that not only serve as places for workers to congregate, but also create a sense of purpose and "innovative spirit," according to Barry Svigals. Unanimously, designers say transparency is the No. 1 driver of office design. For all but the most traditional sectors, formality is in demise, and that's reflected in spaces that are either literally transparent (incorporating glass walls and doors) or barrier-free (with areas shared by employees from the top of the company to the bottom). Open space, experts say, cultivates open minds. 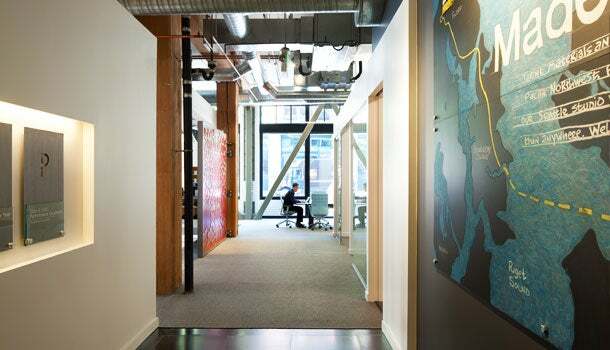 "Employees' behavior inside a space really affects performance metrics," says Brad Pease, a Seattle-based architect and director of signature buildings for Paladino and Company, a sustainable design consultancy. "So, when a leader says, 'My office is a collaboration room,' everyone pays attention and gets access to the context, and that makes them feel authentic." The trend extends to client spaces such as reception areas and conference rooms. Whereas they once telegraphed authority, such staid spaces convey detachment and concealment in the now and future office. "We consider those things dead," Pease says. "What our clients value is the access to ideas. A formalized lobby with a reception desk that I have to staff is a space that is not generating any ideas for us." Instead, Pease advocates integrating those spaces into the office, so that clients walk in the door and immediately see work in progress. "Seeing the cutting-room floor has value. When clients see we use every piece of real estate, and it's full of ideas and idea-generation, they know what they're paying for," he says, adding, "and, they get to see the value of our firm in the front door, which is our people." "Employees are not hidden away anymore behind a reception area," notes James G. Phillips of TPG Architecture on New York's Long Island. "The corporate culture is right there, front and center, and it's [now] about people more than anything," he says. "It's really quite revealing." SkB Architects incorporated movable walls and adaptable furniture into the design of the Watson furniture showroom to allow their client increased flexibility in how they showcase ideas. SkB is now working with Paladino and Company on Paladino's new office space in Seattle. The designers say today's flexible offices reflect a business's value statements and the way employees communicate among themselves and with clients. Increasingly, the office of the future communicates a company's culture and values, taking a page from the hospitality industry--from cafe spaces that host collaboration and conferencing to dedicated respite areas for employees. "We are now talking significantly about engagement issues from the design perspective," says Janice Barnes, who studies organizational behavior in her role as a principal at the New York City office of architects Perkins + Will. "It's about how you give a consistent message to the clients you want to attract, and what you want to communicate to your employees." Phillips says TPG Architecture has designed several offices that combine a reception area with a cafe; clients are offered an espresso upon entering and can watch work in progress. "We learned a lot from our retail clients about brands and brand equity, and a lot of that's transferable to our office clients," he says. "Everything that's physical should support the company mission." In San Francisco, CBRE's Collins cites Autodesk, a software company that created a gallery of products designed with its 3-D software. More than a showcase, it combines hospitality and branding in a space that displays not just what the company's team does, but who they are. "It becomes a customer space, but it connects employees to what their clients are doing and how you connect to the brand," Collins says. "It's a light-bulb moment [that] gives them context." The studio for downtown Austin real-estate consultancy Den Property Group, created by Bercy Chen Studio, illustrates a trend small businesses are borrowing from large tech companies: shared workspaces in which no one "owns" a desk or a station. The open plan is highly flexible, allowing agents to work individually or in groups, and reflects the paperless company's embrace of technology. "The most important consideration for small businesses, other than cost, is flexibility, especially in progressive cities with a creative class," says architect Thomas Bercy of Bercy Chen Studio in Austin. He says he's seeing smaller companies borrowing from the tech industry in the way they leverage shared workspaces. A recent project for a paperless real-estate agency featured 22 stations--none of them dedicated to any one person. "Anyone can come in, plug in and connect to the server. It gives ultimate flexibility. There's no longer a need for as many office stations as there are employees, and that's a trend we'll see more of," Bercy contends, adding, "I think people want two things that are competing with each other: They want complete openness--no more of the '70s or '80s kind of office--and they want space for one-on-one meeting." His solution? Small, phone-booth-like spaces where people can meet without disturbing co-workers yet still be within an open office. Hand in hand with flexibility is a new kind of sustainability in which employees operate individually controlled light and temperature settings. More than providing creature comforts, such features are energy-efficient, promote well-being and, in turn, foster productivity and pride of place. "There's a huge growing interest in what you have to do around sustainable design and employee issues, and how they live with that," says Perkins + Will's Barnes. "In smaller companies, that's more about conservation and doing the right thing." She adds that many firms are creating such mindful environments as a way to attract and retain talent. In Chicago, Perkins + Will designed an office for Ideo, a global design firm whose principles are inspiration, ideation and implementation. At the same time, the space had to be in sync with the company's "human-centered approach" toward its employees and clients. Principal Janice Barnes says when a company harmonizes its mission and work environment it can better achieve its goals. 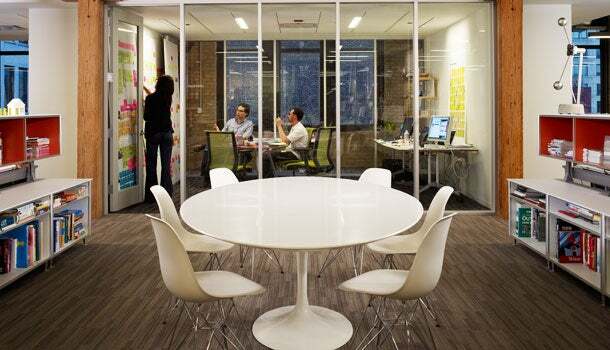 Another clear trend in office design: creating an environment that will appeal to the up-and-coming Gen Y work force. The Pew Research Center describes the Millennial generation as "confident, connected and open to change," and companies are designing offices that accommodate this new psychographic. Weaned on mobile technology, fluent in social media and networking and immersed in issues such as climate change and sustainability, Millennials seek work environments that reflect their ideals. "From a younger generation, there's a sense of wanting to enjoy the work environment," says Chris Bockstael, an associate principal at Svigals + Partners. "It doesn't have to be a stagnant series of rooms where you do one process and then another process, but an environment that promotes collaboration." Paladino's Pease says Gen Y workers place enormous value on authenticity and suss out companies that are doing the right things for the right reasons. "When an employee walks into a space, they can tell a difference in places that value people rather than finishes," Pease says. "And that tells you why we're changing our offices from closed doors to open." Correction: An earlier version of this article carried a caption that misidentified the office of GolinHarris' Chicago headquarters and its architects. Another caption incorrectly attributed the design for Watson's Seattle showroom. It is SkB Architects, who is now working with Paladino and Company on Paladino’s new office space in Seattle.